I am at ‘The Bluff’, a granite outcrop near the tip of the Fleurieu Peninsula. 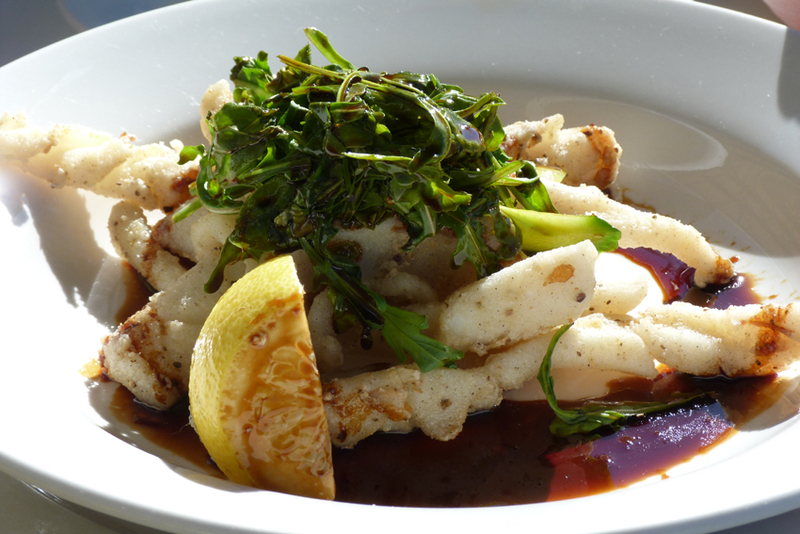 Comfortably tucked into a wicker chair on the balcony of the ‘Whalers Inn’, I am enjoying a plate of local calamari and nursing a fruity white from one of our coastal vineyards. 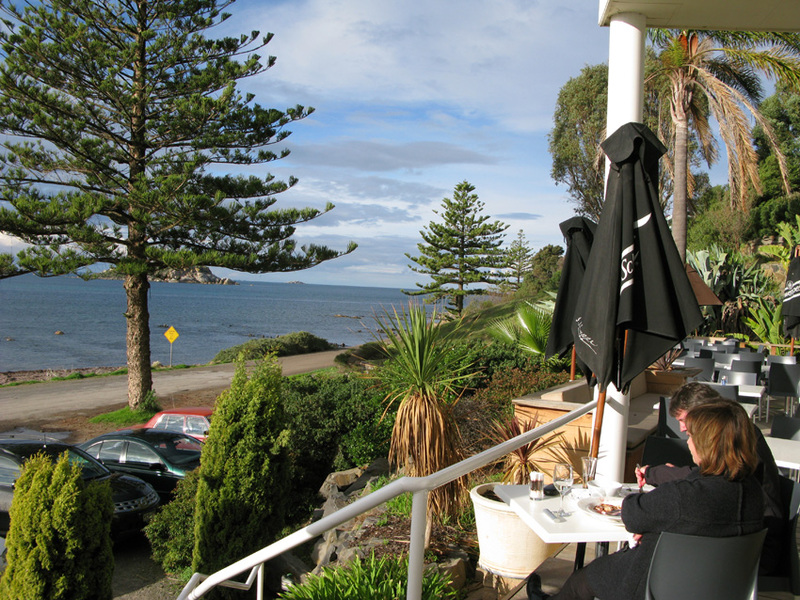 The restaurant is only ten minutes drive from the centre of Victor Harbor, the south coast’s largest town. My field glasses and camera are within easy reach and every few minutes I scan the horizon beyond Wright Island for a tell-tale blow, breach or the raised fluke of a Southern Right Whale. I can just make out one animal a few kilometres out to sea and I am hoping that it will make its way closer inshore. Only a few days ago two adults and a calf were frolicking in the bay just a few hundred metres from where I am sitting. In fact, well over 40 whales have been seen during the last month. Southern Rights regularly migrate with their calves en route to their Antarctic feeding grounds at this time of year. No such luck. The whale heads further out to sea and I know that it is late in the season and the chance of another sighting is slim. 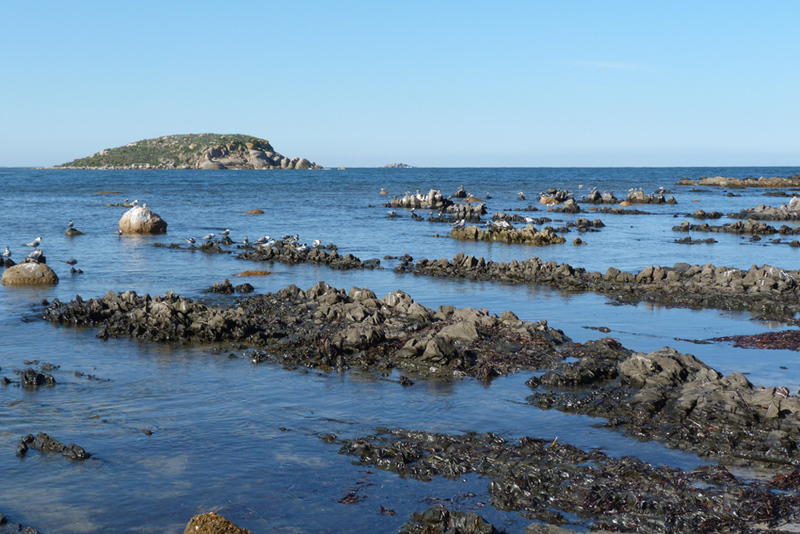 I shift my focus to the rocky foreshore where jagged outcrops of dark rock trail into the sea. 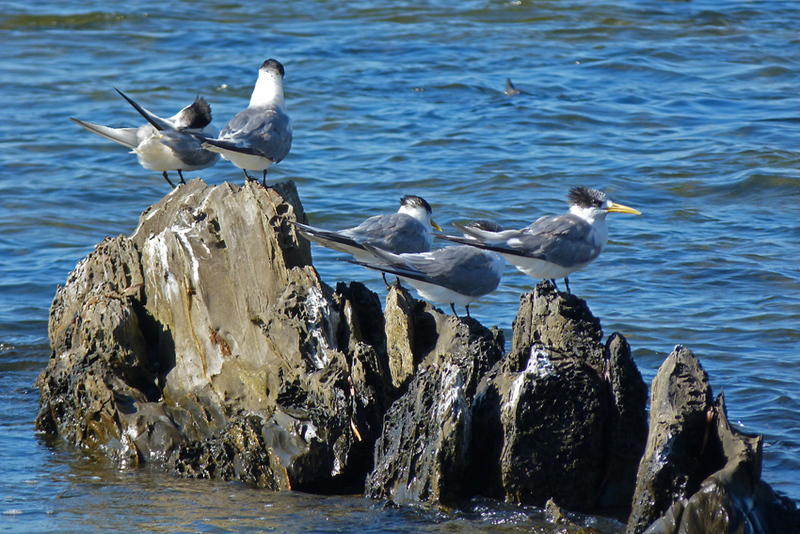 A strong offshore breeze is ruffling the feathers of a group of caspian terns that are precariously clinging to the rocks. Over the last few hours they have been alternately patrolling the rolling swell between Wright Island and the mainland searching for baitfish then resting on the shoreline. A little closer to the town, between a stand of huge Norfolk pines, there is a boat ramp and every so often anglers motor in from the deeper water and tie up at the dock. 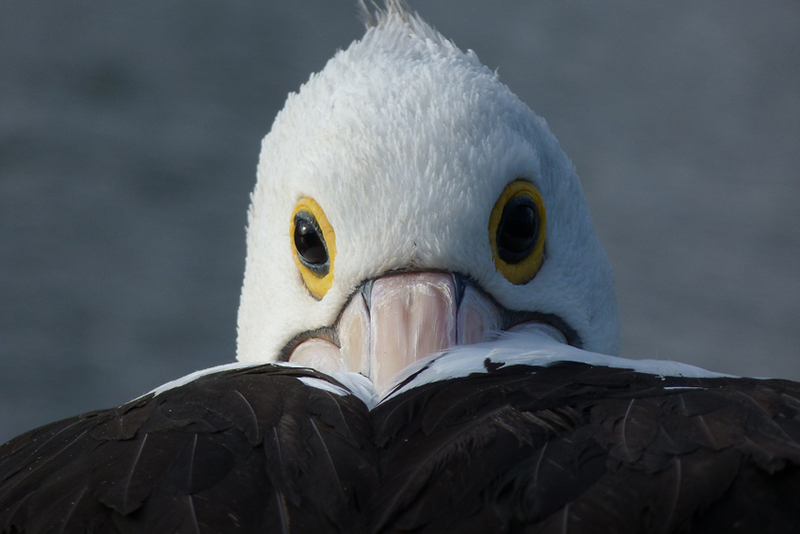 Several large granite boulders lie close to the channel and a couple of Australian pelicans have been patiently ensconced on their smooth surfaces eyeing each craft in the hope of a fishy handout. They are not too fussy and a few mullet, salmon trout or even some unused bait usually makes their wait worthwhile. While I finish my calamari the birds are rewarded by a boatie and his family of pelican friendly kids. There are, of course, the usual silver gulls flying, scavenging and wading in the shallows in search of any kind of food from a discarded potato chip to an unwary shore crab. But amongst their sleek silver forms I catch sight of a larger yellow beaked gull. 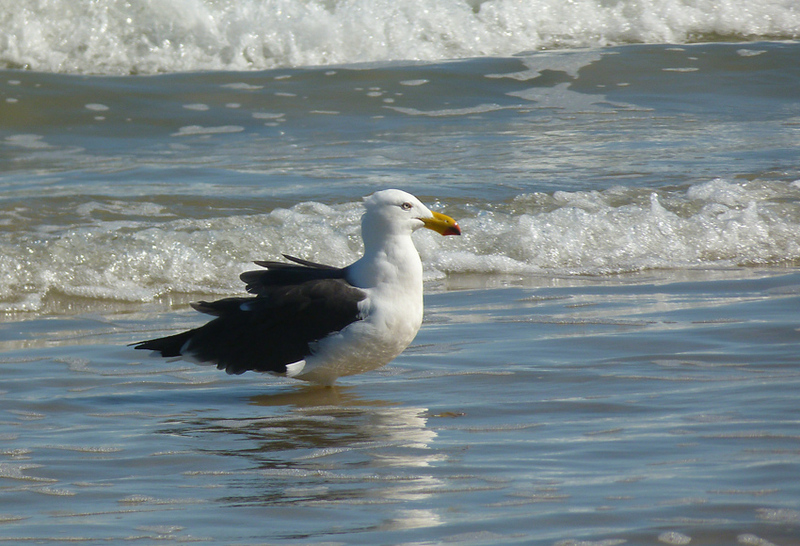 It is a pacific gull, a less common species in this area, and it is wading in the shallows searching for prey in one of the tiny beaches that form between the rocky outcrops. As the afternoon wears on and the temperature climbs, I finish my glass of wine, pay the bill and stroll down to the car. The sea is inviting and my snorkelling gear and underwater camera are in the back. Today I have dined well, photographed a diverse collection of seabirds, watched whales on a dazzling blue ocean, and now I have the chance of encountering some slightly smaller varieties of marine life in a great dive location. That encounter will be the subject of a future blog.